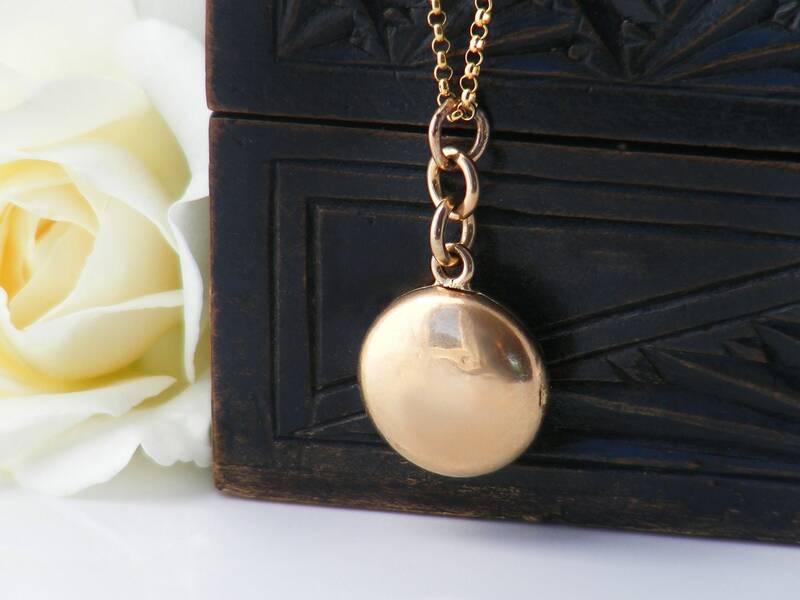 A petite antique gold locket from the late 1800s. 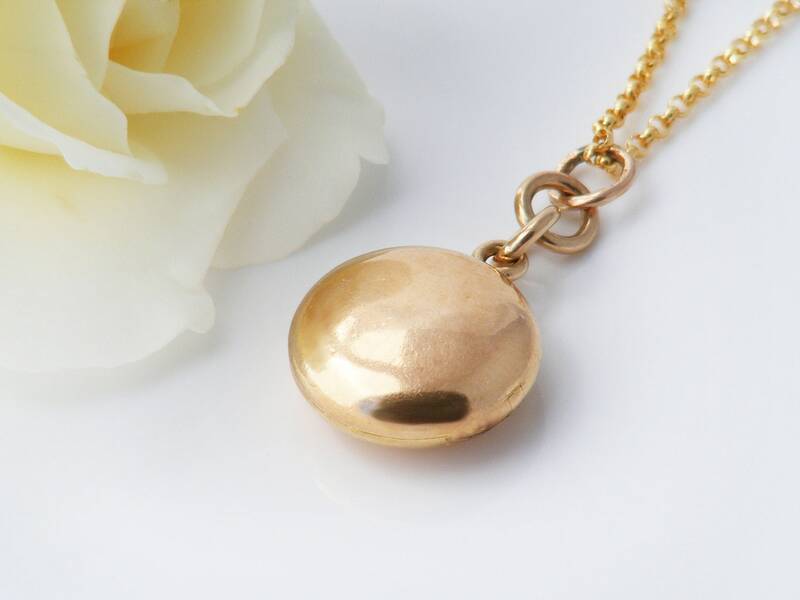 Plain polished 15 carat gold and very pretty, this sweet locket looks like a little gold button! 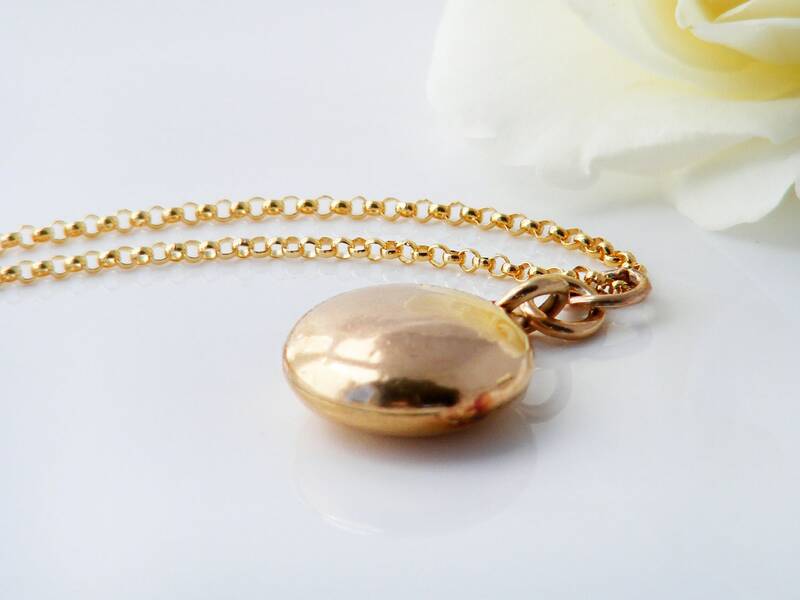 The locket is 15ct yellow gold with the soft rosy hue of old gold. Gold, with a '15' stamp to the back - proof of its antiquity as 15 carat gold was not used as a gold standard after the year 1932. The inside has two slip frames with original celluloid photo covers and the locket is suspended on a short length of original fob chain (these look to be gold but may be gold filled). The integral hidden hinge on this locket is just amazing - so well made that it follows the curve of the locket perfectly and can barely be seen. 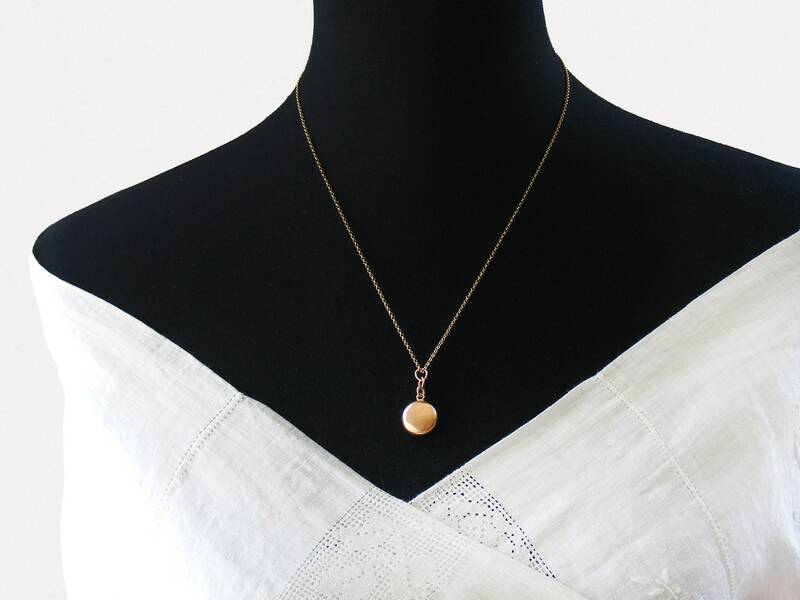 Locket Size: .6 x .6 inch (16 x 16mm) and the drop from the soldered chain is 29mm including the large links. 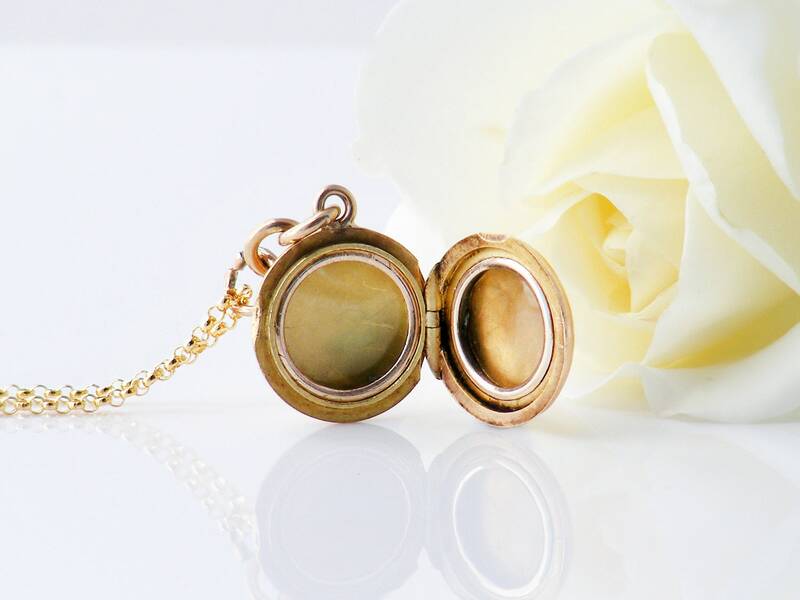 The locket gently puffs on both sides out to approximately 5mm in thickness. 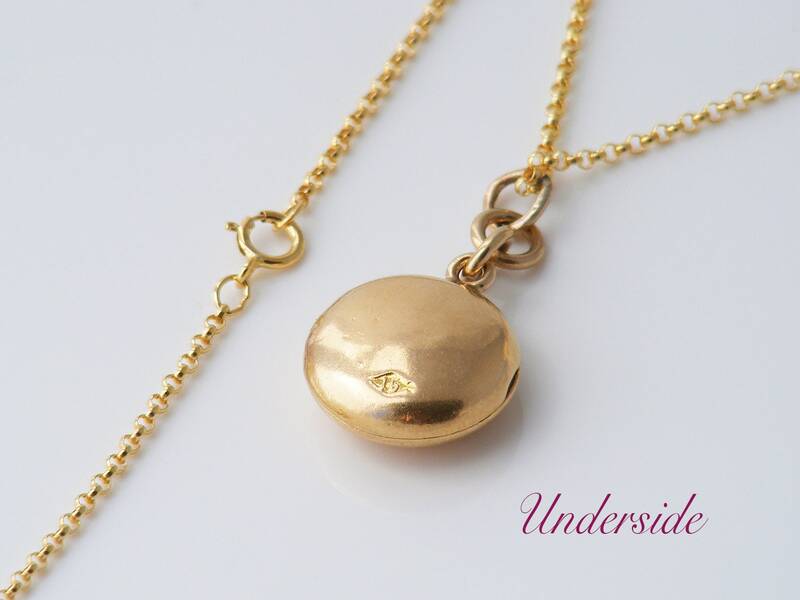 Presented on a new 20 inch or 51cm chain, 14ct gold fill and stamped as such on the clasp. Photograph #2 shows the locket and chain on a life size torso. Condition: The top suspension ring is in well used condition but is still strong - this is the only one that is openable (the lower two rings are soldered closed) and it has likely been opened many times in its life; left in place for authenticity. 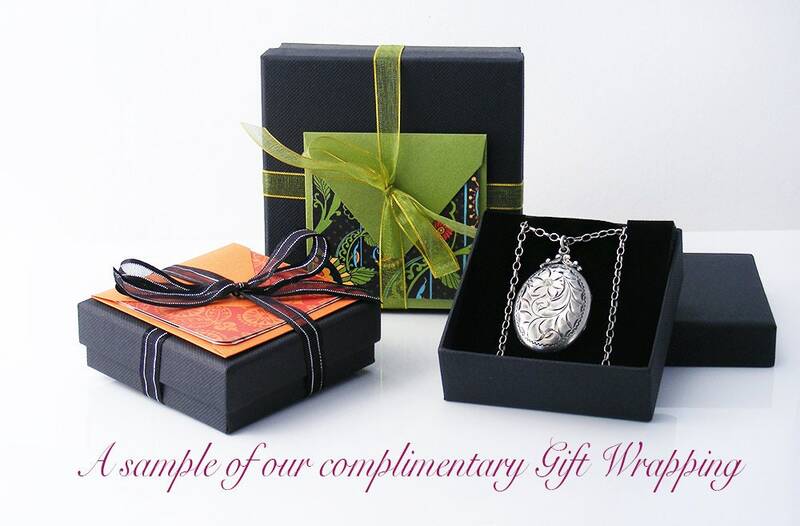 The locket itself is Excellent. Only mild surface wear, no nasty dings or scratches. Closure is tight and firm with no gaps and the beautiful hinge is incredible. NOTE: any dark patches are camera reflections in the highly polished gold. Like a little gold M&M! Such a sweet locket.